Kabir, Rahim, Subhadra Kumari Chauhan, Premchand, Dinkar, Harivanshrai Bachchan… ‘Kavi Sammelan’, a gathering of the greats….? Qutab Minar, Lal Quila, channa bhatura, jalebi, chaat…Are we planning a ‘Dilli darshan’ or a food festival? What is happening at The Shri Ram School, Aravali? This is Navchetna, a celebration of Hindi as a language and as a culture! 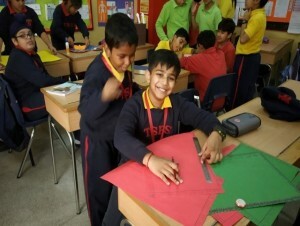 Children from Pravesh Vatika to Form V are engrossed in exploring different aspects of the language and gaining an insight into its gentle influence on various elements of our daily lives. The corridors are humming with excited activity as each form learns about a range of topics ranging from the alphabet, shape and colour to poets and authors of Hindi literature.